The proportion of FTAs in India has not changed much in the last few years. 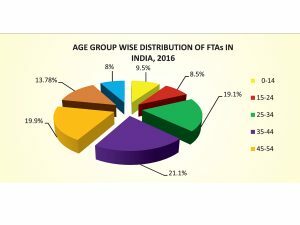 In 2016, the highest numbers of FTAs in India were from 35-44 years age group (21.1 per cent) followed by the age groups of 45-54 years, according to a report by Ministry of Tourism. The proportion of FTAs for the age group of 25-34 years has been the highest from East Asia, West Asia, Africa, Eastern Europe and Central and South America in 2016, according to a report by Minsitry of Tourism. The report also says that for Australasia, South Asia and South East Asia was the age group of 35-44 years. The percentage share of the age-group of 45-54 has been the highest for North America and Western Europe. 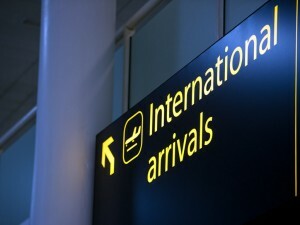 FTA’s in India from different regions of the world has been increasing from all areas. 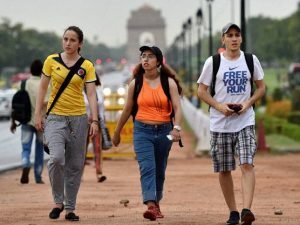 The growth was maximum from Eastern Europe (22.64 per cent) followed by South Asia (12.76 per cent) , Australasia(11.79 per cent), Central and South America (11.25 per cent), East Asia (11.12 per cent), West Asia (8.20 per cent), North America &7.98 per cent), Western Europe (7.94 per cent), South East Asia (6.54 per cent) and Africa (2.9 per cent), according to a report by Minsitry of Tourism. The percentage share in FTAs in India during 2016 was the highest for South Asia (24.93 per cent) followed by Western Europe (23.05 per cent), North America (18.33 per cent), South East Asia (8.74 per cent), East Asia (7.01 per cent), West Asia (5.13 per cent), Eastern Europe (4.61 per cent), Australasia (3.96 per cent, Africa (3.42 per cent) and Central and South America (0.89 per cent). 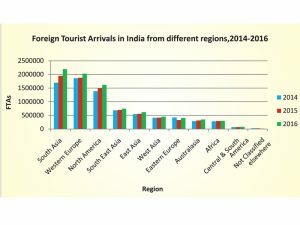 Foreign Tourist Arrivals (FTAs) this August were 7.24 lakh as compared to FTAs of 6.52 lakh in August 2016, and 5.99 lakh in August 2015, according to the latest data released by the Ministry of Tourism. The growth rate in FTAs in August 2017 over August 2016 is 11 per cent compared to 8.8 per cent in August 2016 over August 2015. FTAs during the period January-August, 2017, were 63.98 lakh with a growth of 15.2 per cent over the same period of previous year, as compared to the FTAs of 55.54 lakh with a growth of 9.5 per cent in January-August, 2016, over January-August, 2015. On the other hand, FTAs on the e-Tourist Visa, during the month of August 2017 was a total of 1.13 lakh as compared to 0.66 lakh during the month of August 2016 registering a growth of 71.3 per cent. During January-August, 2017, a total of 9.49 lakh tourist arrived on e-Tourist Visa as compared to 6.06 lakh during January-August, 2016, registering a growth of 56.5 per cent. 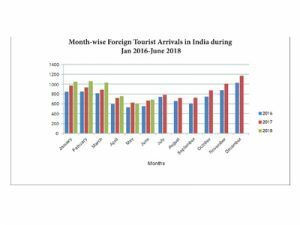 Foreign Tourist Arrivals (FTAs) during January 2016 were 8.44 lakh as compared to FTAs of 7.91 lakh during January 2015 and 7.58 lakh in January 2014. There has been a growth of 6.8% in January 2016 over January 2015. The percentage share of FTAs in India during January 2016 among the top 15 source countries was highest from USA (15.29%) followed by Bangladesh (11.99%), UK (11.23%), Canada (4.87%), Australia (3.97%), Russian Federation (3.71%), Germany (3.27%), France (2.98%), Sri Lanka (2.97%), China (2.74%), Malaysia (2.59%), Japan (2.38%), Rep. of Korea (1.82%), Nepal (1.76%) and Afghanistan (1.62%). The percentage share of FTAs in India during January 2016 among the top 15 ports was highest at Delhi Airport (28.38%) followed by Mumbai Airport (19.59%), Chennai Airport (7.92%), Haridaspur Land check post (6.58%), Bangalore Airport (5.72%), Goa Airport (5.68%), Kolkata Airport (3.92%), Cochin Airport (3.86%), Ahmadabad Airport (3.48%), Hyderabad Airport (2.83%), Trivandrum Airport (1.84%), Gede Rail (1.51%), Tiruchirapalli Airport (1.26%), Amritsar Airport (0.82%) and Sonauli Land check post (0.76%). 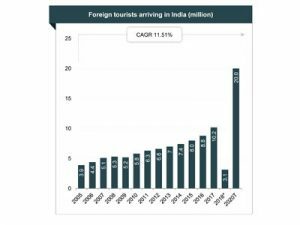 Foreign Exchange Earnings (FEEs) from Tourism in India during January 2016 were Rs 13,669 crore as compared to Rs 12,100 crore in January 2015 and Rs 11,664 crore in January 2014. The growth rate in FEEs in rupee terms during January 2016 over January 2015 was 13 per cent as compared to a positive growth of 3.7 per cent in January 2015 over January 2014.